Many of you know me as someone who is always in the kitchen (or on the computer)! Well, I love to craft also. I think quilting may be my favorite, but I also love to knit and crochet also. 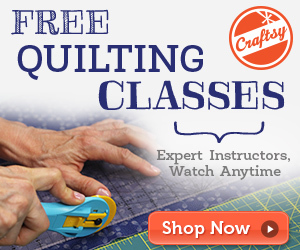 Craftsy is a great place to learn new skills or just brush up on some of the skills you already have. Read more about Craftsy and then go and see what the classes are all about! I recently took a quilting class and I loved it. I could watch the class over and over until I got it! I hope you will take a few minutes to stop by and find the perfect class for you or a family member. Hey, a Craftsy class would make a great Christmas gift! I didn’t know they had free classes. Perfect. I want to start sewing again after we have moved/settled. I have a quilt I started *cough* about *cough* 11 years ago that I never finished. A friend was teaching me but she moved and I didn’t know how to finish. NOW maybe I can get it done! Thanks for sharing this information.